Hawkins Corners, Lee Center, Stokes Corners, West Branch, Point Rock, Ava and into West Leyden. Off to another season! Hope you enjoyed the warm summer and now we turn the page and look forward to a great winter for snowmobiling. A lot of work was completed by a handful of dedicated volunteers in completing the Point Rock reroute (C4I). This reroute was started late last fall but could not be finished due to the weather, bulldozer breakdown, and tremendous amount of work involved. 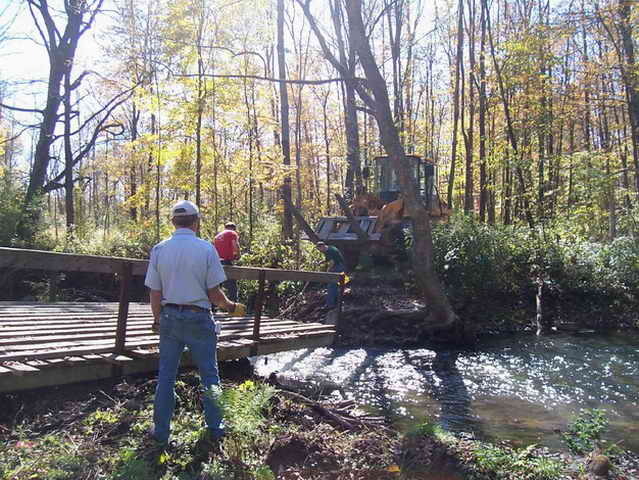 This summer, five bridges were built and installed and four culverts set as well as trail grading. Work was done in not the best of conditions either, with mud, bees and heat in the mix. Many thanks to those responsible for making this reroute possible, from obtaining landowner permissions to trail work completion. Since I don’t have a list of the workers I won’t mention names for fear of leaving someone out. We are all happy to see this connection open once again. The club bulldozer was used extensively on this trail but not before a major overhaul on it which was done last winter by some talented mechanics, namely Lance Blood, Dave Seaton, Dave and Darwin Piersall and Andy Lim. Volunteers are needed for other work that needs to be completed for the upcoming season, namely, brushing, staking, signing of the entire trail system. We need your help so contact Dave Seaton at 315-335-9881 or send an email to indytraks@twcny.rr.com with your contact information so we can let you know when, where and what is scheduled. Volunteers are solicited for trail grooming as well. If you are mechanically inclined and would like to learn to operate the groomer, contact our groomer coordinator, John Beggs, at 315-337-0359 as soon as possible. John will be holding a meeting later this fall for interested members. Keep up with club news by checking the club website and Facebook. Club news, work schedules, etc., will be posted as needed and daily grooming reports will be posted daily, usually after 9:00 a.m., when grooming is in full swing. A snowmobile safety course will be given at the Lee Town Hall for youth who are age 10 and over the first weekend of December (30 Nov/1 Dec). Attendees have to attend both sessions. More info on this later. New York state has mailed the sled registration renewals. That means its time to renew your club memberships and be ready to ride when the season opens, which is 10 December 2018 for the northern zone where our trail system falls. Membership renewals are as last year, either online with credit card or by mail to the club with a check. Either can be handled through the club website at www.trailbusters.net. Membership fee remains the same, $30.00 for family or individual. In June the club awarded our annual scholarship of $250.00 to Spencer Pisaneschi of Rome, NY. A 2018 graduate of RFA, he is attending Alfred State College majoring in construction management. Our May election of officers resulted in only one change, that of vice-president. We welcome Andy Cooney to this position. Many thanks to outgoing VP Andy Lim for his contributions as officer. He promises to stay active and support the club in other work aspects. Please keep your email addresses current with the club so we can reach you. Send any changes to indytraks@twcny.rr.com. Lastly, support your club by attending our monthly meetings. They are held on the second Tuesday of each month at 7:00 p.m. at the Lee Town Hall on Stokes-Lee Center Road. The schedule for the coming year follows. Please save this schedule and mark your calendars.